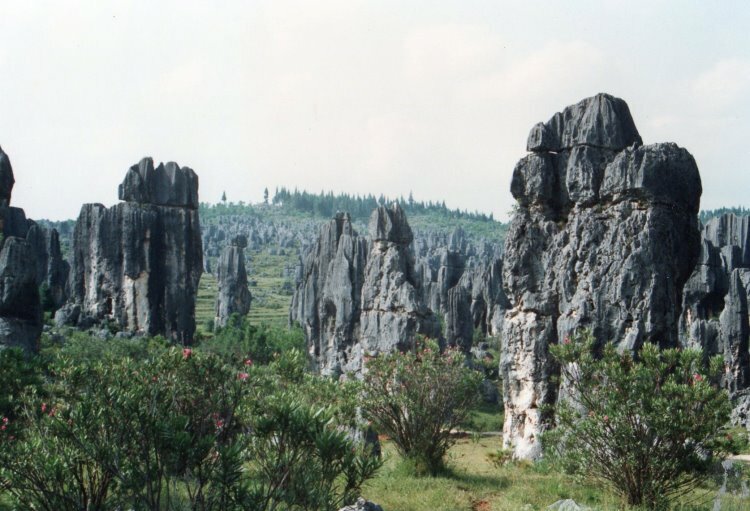 The Stone Forest is a weird crowd of fluted and scoured pillars and towers of heavily eroded Karst limestone, set in pleasing countryside south of Kunming in Yunnan. A World Heritage Site. Wander along paths that become almost subterranean as you pass under crazily leaning monoliths, passing quiet glades and slightly sinister green, shaded pools, occasionally surfacing to take in the scene from a viewpoint pavillion. When it is all getting a bit claustrophobic, the rock jungle disperses and you are in cropped meadows from which the rocks protrude as monoliths. Enjoy an atmospheric picnic, then wander out along the lanes to the nearby villages. 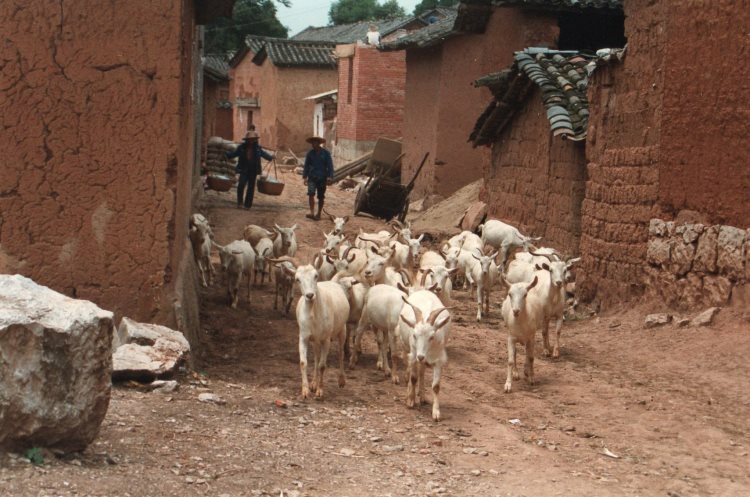 Real rural China. Be prepared for mass tourism, though. 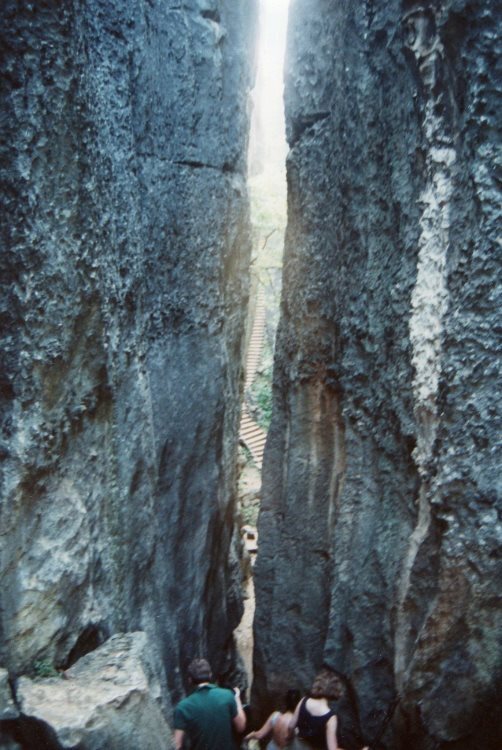 The Stone Forest is famous in China, and the crowds can be depressing. The good thing, though, is that 95% don't go beyond the central sites, so you can still find seclusion. 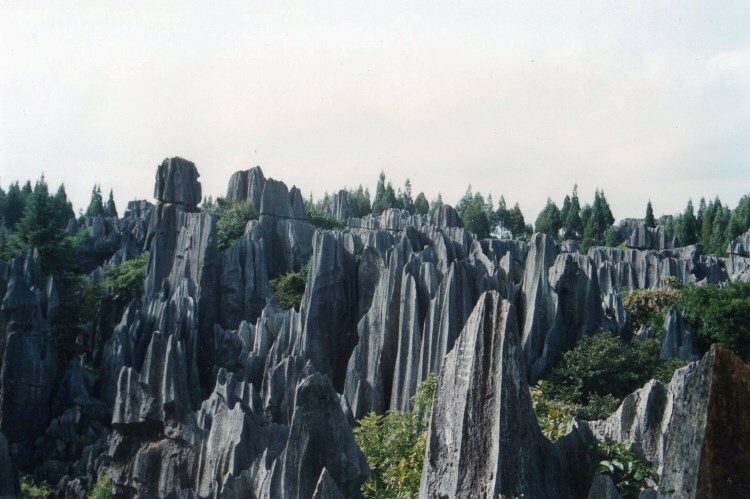 Kunming's most famous local attraction is the Stone Forest, 125km to the south-east. 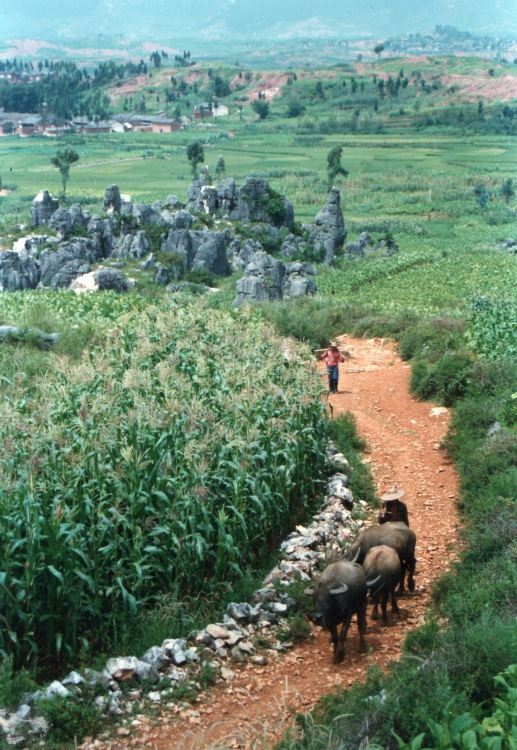 It is an extraordinary area of limestone pinnacles and excrescences, none over 100 feet high. 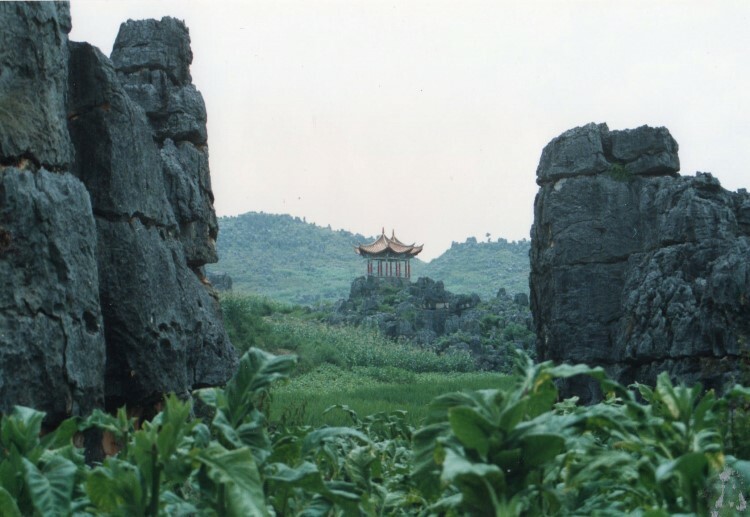 Its history is similar to its better-known cousin at Guilin; a layer of limestone formed under an ancient sea subsequently eroded by rain into gulleys, sink-holes and caverns and finally the fantastic shapes we now see. 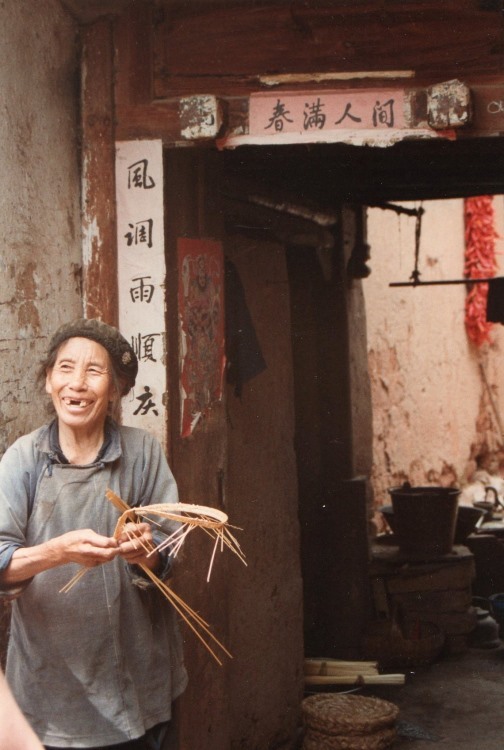 Whereas the Guilin countryside has evolved into the spectacular peaks, often falling sheer into the Li river, which were so loved by Chinese classical painters, the forest's limestone bed must have been thinner or more heavily eroded. The middle of the forest is fascinating but not beautiful. Paths ascend and drop between bewildering peaks and piles of fallen rock, sometimes virtually impassable to anyone carrying a gut or bosom. From the tops of these pinnacles, when you can get up there, the world is a plain of fluted grey spikes alleviated by occasional trees and distant hills. In the troglodyte innards the sky is almost invisible. Our first sight in the forest were garishly-clad 'minorities' selling their bright bags, ponchos, cushion covers and hawking rides on camels and zebras. 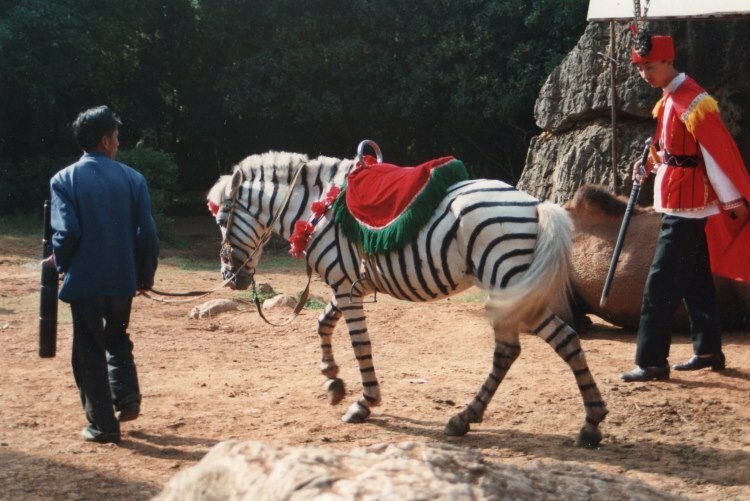 On closer inspection these turned out to be white ponies painted with black stripes. On the face of one the markings came together in an ironic CND sign. Beyond the encircling track, the world is very different. The spires rise among close-cropped meadows on abandoned rice terraces. Looking back at the forest, now serried like an ancient army, we sat on a slab and ate smoked oysters. Time seemed immaterial here. Over the next ridge, paddy and corn fields alternate with rocky forest outposts. Further out, the plain begins, nestling unspoilt (when we were there) villages. It is classic rural China.